The Sterilight Copper™ system is a reliable, economical and chemical-free way to safeguard drinking water in any residential application. The Sterilight Copper™ system has been designed and tested to ensure quality drinking water is at everyone’s finger tips. Maintaining good water quality is important for industries which require large amounts of clean purified water free from bacteria and viruses. 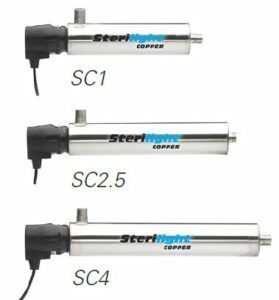 Hence the Sterilight Light Commercial Series is a light powerful range which provides a high flow rate. • Equipped to inactivate chlorine-resistant parasites such as Cryptosporidium and Giardia, harmful bacteria like E.Coli, and viruses not visible to the naked eye. 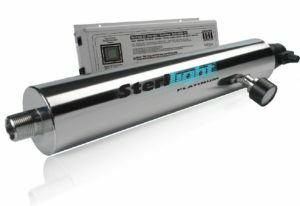 • Specially designed and tested Sterilume™-HO lamps provide consistent and reliable ultraviolet output over the entire life of the lamp (9000 hours) to ensure continuous purification. • The system is easy to maintain and service with easy lamp and cartridge replacement and quick disconnect fittings. • New Safety-Loc™ connector with interlock that ensures power is disconnected before lamp can be removed, hidden ground wire, and visual lamp on indicator. • Built with a durable stainless steel chamber to prolong life and eliminate ultraviolet light degradation. • The ICE power supply visually displays the remaining lamp life and will go into alarm if the lamp fails. Monitored systems also have the ability to read the percentage of UV output. • The power supply has a sealed case to prevent damage from accidental water intrusion and is fully CSA and CE compliant. • Monitored systems have a specialized 254nm UV intensity sensor which notifies homeowner of changes in UV performance. • Monitored systems allow for the installation of an optional solenoid valve which will stop the flow of water through the chamber should the UV performance fall below a safe a level. The Sterilight Copper™ system is a reliable, economical and chemical-free way to safeguard drinking water in any residential application. The Sterilight Copper™ system has been designed and tested to ensure quality drinking water is at everyone’s finger tips.